WONDERFUL CRUNCHY DELICIOUS COLORFUL I THINK!! 'replica' of Outbacks' delicious chopped salad. I thought this was a superb choice. Chop the lettuces into smallish bite-sized pieces; use a salad spinner to wash and dry them. Slice the green onion. 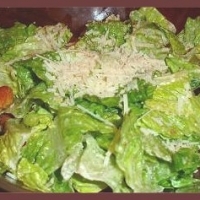 Place the chopped lettuce in a large serving bowl (one large enough to toss the salad in). Add the vinaigrette and toss thoroughly to coat. Sprinkle with the chopped onion. Break the cooled pecan slices apart and sprinkle them over the salad. One of the best salads at a restaurant anywhere and this recipe comes the closest that I could imagine! I might add a bit more balsamic or a little sugar the next time to give the sweetness factor a boost! This recipe sounds perfect! Thanks a bunch! I love that salad at Outback - it has the best flavors and the tastiest vinaigrette! I will make this one for sure...thanks for the post!! Thank-you for the "Heads-Up" on this recipe! It certainly is a "5"FORK!!!!! Winner!